Toronto Life magazine's strategy in recent years has not only to be the best city magazine in Canada but also to build a robust web presence. In this, it is like many -- or most -- consumer and b2b magazines today. So it is interesting to see the magazine's announcement that its TorontoLife.com has grown its audience to the point where it has more than 300,000 unique visitors and more than 2 million monthly page views. It's an almost 50% increase in readership in one year -- built on "news you can use", the bedrock of the print magazine content; where to eat, where to shop, where to be entertained. Page views are up by 46 per cent and visits per unique visitor have increased 58 per cent. 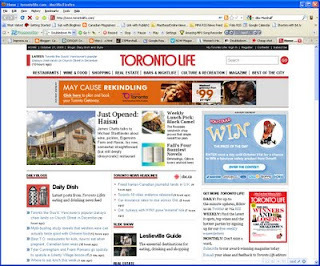 "Few premium online destinations in Canada, particularly with our niche, regional approach, can say that their site has attracted 90,000 new readers," says Gary Campbell, Senior Web Producer for TorontoLife.com. Campbell, not surprisingly, credits the success to the online team but also the commitment to daily blogs and aggressive refreshment of the site ( five or six times every day). Cool, maybe now they can start paying their print contributors for web rights. Women's Health named best on Ad Age "A-list"